If plain old words aren't enough to inspire a trip to Peru, then maybe the following aerial images will help you make that final decision to jump on a plane and head to the land of the Incas. We'll start in the coastal capital of Lima before flying over the Andean highlands, then push further east into the vast lowland jungles of the Amazon River Basin. And while most of these photos are meant to inspire, a few will show the human-inflicted scars that continue to appear across the three geographic regions of Peru. Lima is a city of huge economic inequality. Looking down on the wealthy coastal district of Miraflores, particularly the Larcomar Shopping Complex seen in the image above, you can see the modern face of the Peruvian capital, with manicured parks and glass-fronted hotels that could be from any city in the developed world. Head further out to the city outskirts, however, and you'll see dusty slums that cling to the desert landscape, the so-called pueblos jóvenes ​(young towns) that house the capital's poorest inhabitants, many of them immigrants from poorer rural regions. The Pacific waters along the coast of Peru are typically cold but often ideal for surfers. If you want crystal clear swimming conditions, you'll find far better options along the coasts of Colombia or Brazil. But for surf, Peru offers consistent swells and plenty of waves for both beginners and experts. The Pacific Ocean, of course, also helps fuel Peru's ever-increasing gastronomic reputation, and the food along the Peruvian coast is sensational. With everything from rich shellfish broths to delicate ceviches, the entire coast is a playground for culinary travelers. Perhaps no aerial view of Peru is more famous, or more mysterious, than that of the Nazca Lines. The huge geoglyphs can only be properly appreciated from the air, a view made possible by the light aircraft that take passengers for short flights above the Nazca Desert. The Pan-American Highway, known as the Panamericana in Peru and South America, stretches for approximately 30,000 miles as it crosses through North, Central and South America. The Peruvian leg of the Panamericana crosses from north to south along the entire eastern coastal strip of Peru, from the Peru-Ecuador border in the north to the Peru-Chile border in the south. Most overland travelers in Peru will find themselves traveling along the Pan-American Highway at some point, especially heading south from Lima toward Arequipa, through desert landscapes such as the one shown above. Reaching heights of around 6,791 feet (2,070 m), Cerro Blanco is considered the highest sand dune in the world. As you can see from the image above, the light-colored dune is surrounded by arid mountains within the scarred desert landscape. Located just to the east of the town of Nazca, Cerro Blanco is a popular destination for dune buggy rides and sandboarding. Head east over the deserts and you'll soon start to rise up into the Andes, a mountain range that runs like a spine through Peru. The mountains pictured above are located between Arequipa and Cusco; if you want to see aerial views such as these in Peru, it's always worth getting a window seat, especially if you're flying during the day. But it's not all jagged mountains in the Andes. The high plains of the Altiplano, or Andean Plateau, lie in southern Peru and eastern Bolivia. Here you'll find the world's highest navigable lake, Lake Titicaca. The spectacular aerial photo above shows a high altitude Andean lake somewhere in the Pasco Region in the Central Highlands. Further to the north lies Cerro de Pasco, capital of the Pasco Region and one of the highest cities in the world. Cerro de Pasco is also an important mining center with a huge open-pit mine (so nowhere near as pristine as the landscape shown above). The Cordillera Blanca mountain range is home to some of the highest mountains in Peru, including the country's tallest peak, Mount Huascarán (22,132 feet). The range is located in the Ancash Region of Peru and forms part of the far larger Andes range. With more than 30 major peaks and hundreds of lakes and glaciers, the Cordillera Blanca attracts mountain climbers and trekkers from around the world. Huaraz, the capital of the Ancash Region, serves as the main hub for excursions and expeditions in the area. Huaraz is located about 175 miles (280 km) north of Lima. Roughly 312 miles east-southeast of Lima lies the Inca citadel of Machu Picchu. For many visitors to Peru's most famous attraction, the final leg of the journey runs along the switchback road in the image above, which leads from the town of Aguas Calientes to the archaeological site above. You can see an alternative view of this area in this spectacular satellite image of Machu Picchu. The archaeological site of Saqsaywaman sits just above the city of Cusco. While not as famous as Machu Picchu, this vast complex was just as important to the Inca Empire, if not more so. You can clearly see the site's distinctive zig-zag walls in the image above, but you need to take a closer view to appreciate the incredible dry stone walls and their precise construction. Saqsaywaman is one of a number of archaeological sites featured on the Cusco Tourist Ticket, which grants the holder access to a wide range of sites and museums in Cusco and the Sacred Valley. The small market town of Urcos is located about 26 miles (42 km) southeast of Cusco. It sits alongside the Urubamba River (Vilcanota/Willkanuta), the same river that runs through the Sacred Valley. Here's the first of those not-so-inspiring aerial images I mentioned in the introduction. Head 100 miles south of Cusco and you'll arrive in the vicinity of the Tintaya Mine, a huge open-pit copper mine that began production in 1985. At its height, the mine was producing 120,000 tons of copper in cathode and concentrate form each year. It has been the site of heated protests in the past, with local residents and activists trying to force the mine's owners to take responsibility for the pollution of nearby rivers. The Tintaya Mine is now in the process of closing down, but the complete closure could take until 2039. Leaving the highlands and heading further east, we arrive at the green and sprawling Amazon River Basin. The aerial image above shows the Tambopata River meandering through the Tambopata National Reserve. The reserve protects an area of 274,690 hectares (1,060 sq miles) of lowland rainforest in the Madre de Dios Region of Peru. It is home to many of Peru's endangered and critically endangered animal species, including the giant otter and Peruvian spider monkey. Stuck out in the middle of the Peruvian Amazon, Iquitos (pop. 435,000) is the largest city in the world inaccessible by road. If you want to visit, you either need to fly in from Lima or hop on a boat from Pucallpa or Yurimaguas (near Tarapoto). Iquitos expanded rapidly during the rubber boom of the late 1800s and early 1900s. Today, its location on the banks of the Amazon River makes it a prime departure point for Amazon river cruises. The city itself is also a fascinating place to explore, with its sprawling traditional market, stilted river homes and various other attractions. Human activity in the Peruvian Amazon -- and the entire Amazon region -- has resulted in well-publicized environmental concerns, including the negative and destructive effects of oil and gas extraction, mining and deforestation. The image above shows an area of deforestation in the Satipo Province in the central Amazon rainforest of Peru. The trees were cut down and burned by migrant farmers; the ash will help fertilize the soil. The clearing of forest for farmland is one of the main causes of deforestation in the Amazon jungle. Unlike the wide and meandering rivers that slowly wind their way through the Amazon Basin, major road and pipeline projects can all too quickly cut a path through the otherwise untouched jungle. The building of the Interoceanic Highway from Peru to Brazil is one current project that continues to raise concerns regarding both its environmental and social effect on the Amazon. Then there are pipeline projects from oil and gas companies such as Petroplus. The deliberate dumping of oil water, combined with leaking pipelines, has caused terrible damage to the rainforest and its delicate ecosystem, as well as to the indigenous tribes who have lived in the Amazon jungle for centuries. Wrapping up this aerial tour of Peru on a positive note, here is a photo of a huge meander in the Nanay River, which enters the Amazon River at Iquitos. Despite the impressive size of this meander, the Nanay is only a fairly minor tributary of the Amazon. At about 196 miles in length, the Nanay River isn't long enough to make it onto the list of the top 10 longest rivers in Peru. The Napo River sits in tenth position at 414 miles long, while Peru's longest river, the Ucayali, runs for 1,100 miles. 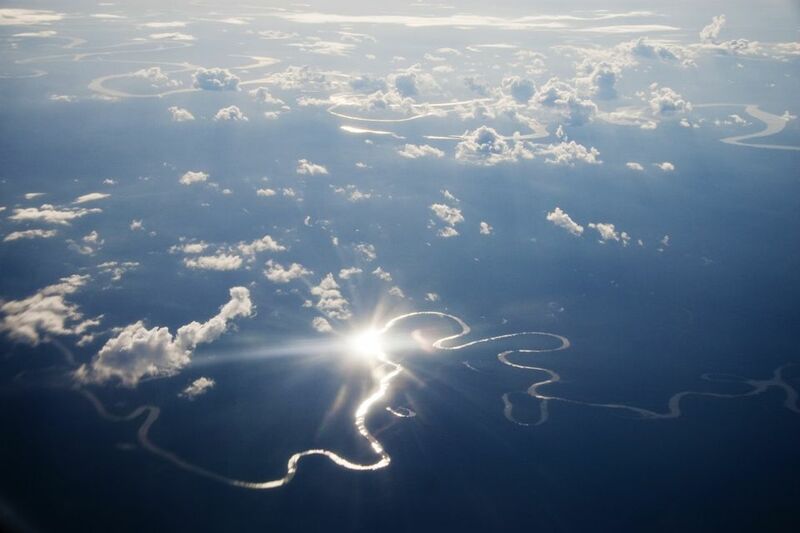 The Amazon River stretches for a grand total of at least 4,000 miles, but only 443 miles are contained within Peru.